We filed an amicus curiae brief with the U.S. Supreme Court on behalf of the Free Speech Defense and Education Fund, Conservative Legal Defense and Education Fund, Lincoln Institute for Research and Education, Citizens United Foundation, and Downsize DC Foundation in support of United Seniors Association’s (USA) petition for a writ of certiorari. Our firm filed an amicus brief in the U.S. Supreme Court on behalf of Citizens United Foundation in this Pledge of Allegiance case. This amicus brief addresses the vital threshold issue of standing. 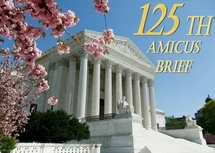 Our firm filed an amicus brief in the U.S. Supreme Court on behalf of Public Advocate of the United States, Conservative Legal Defense and Education Fund, Lincoln Institute for Research and Education, Help and Caring Ministries, Inc., and Citizens United Foundation in support of the State of Texas urging the Court to uphold the the Texas Homosexual Conduct Statute. Federal Election Commission v. Christine Beaumont, et al. Building and Construction Trades Department, AFL-CIO, et al. v. Raymond J. Donovan, et al. Representing Public Service Research Council, this brief urges the Supreme Court to uphold regulations issued by the Reagan administration properly implementing the Davis-Bacon Act. This brief represents Public Service Research Council regarding whether Congress, in enacting the Urban Mass Transportation Act of 1964, created a federal private right of action for employees of a municipally owned transit system for an alleged breach of a local collective bargaining agreement.